What Are Some Good Adoption Fundraising Ideas? One of the first things we did when we decided to adopt was to approach our church and ask them if we could use their community hall for a dinner. We enlisted some friends, and together we made pots of spaghetti, loaves of bread, and ice cream for dessert. It was a wonderful way to bring our friends and community together for an evening. During the dinner, we spoke about why we decided to adopt, why we wanted to give a forever home to a child from China, and then asked if those present would be part of our journey. After all, it takes a village! We asked for a small donation from each family and used a chart to exhibit how each donation took us one step closer to reaching our goal. For ten years, I lived in a one-bedroom apartment in Brooklyn, but when we moved to the Washington DC area, somehow we acquired more stuff. I’m convinced it breeds in the dark recesses of our attic and in the crawl space under our house. But guess what? That stuff is perfect for a yard sale! Not only was it a great way to spring clean, but when we announced we were holding a yard sale for our adoption, people came out in droves—both to offer more stuff for us to sell and to purchase our gently used items. It was such a success during our first adoption that during our second adoption, we took our yard sale online. Facebook Marketplace is a great way to do this, and setting up a PayPal account is easy. There’s an old saying, “Tell me a fact and I will learn it. Tell me a story and it will live in my heart forever.” Though it was easy to talk one-on-one with our friends and family who live in the area, my husband and I have lived in many places throughout our lives. Our friends and community are spread across the world, and we wanted the chance to share our adoption story with them, so we wrote letters. We waited until we had a referral and then explained why we wanted to adopt, why we wanted to be Jack’s forever family, and why we wanted our friends and family to accompany us on our journey. Though some adoptive families do this independently, a great resource which we used is AdoptTogether. AdoptTogether provides a nonprofit crowdfunding platform for family and friends to give donations directly to you. What’s more, you can set up a profile for your family and actively track and list your fundraising progress. When I worked in theater, we were always looking for ways to make additional money. See a show you like? Buy the mug, the t-shirt, and the CD. 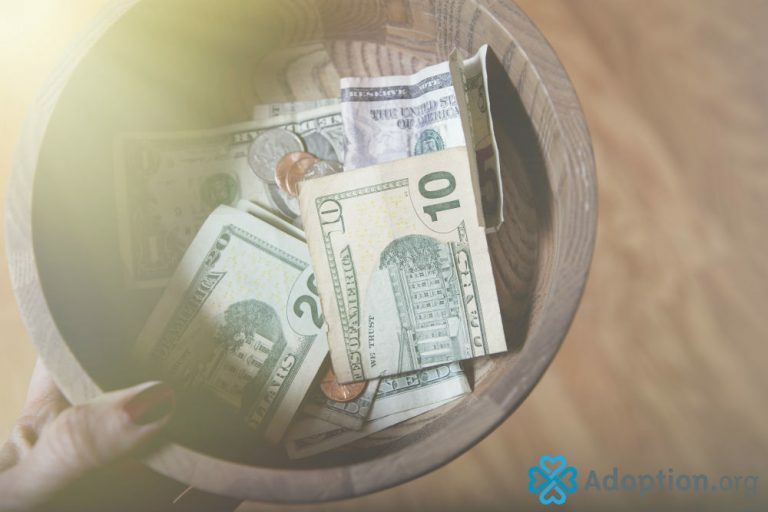 It’s a great way to increase revenue, so why couldn’t the same idea apply to adoption fundraising? With this idea in mind, we created t-shirts and cards which were available for purchase online (though Facebook Marketplace), at our dinners, at yard sales, and sold out of the back of my car to interested family and friends. A good place to start is to find a wholesale provider. We used Bonfire, but there are many options out there. Depending on your child’s state or country of origin, another idea is to sell something from that region—like paper beads from Africa or coffee from South America. One of my favorite things we used to do in New York was to host “salons” at one another’s homes. A simple meal, usually soup or chili, was provided, and then whoever was hosting would sing, screen a film, or tell a story. Though a bit “outside the box,” we decided to do the same for our adoption fundraising, but instead of hosting a free event, we would charge a moderate ticket price/donation. During one evening, I presented my one-woman show, Appearance of Life, and during another, we screened a film about imperial China and then my husband (a history buff) led a fascinating group discussion. Whether you dabble in water colors, love to sing karaoke, or are an authority on baseball, everyone has a talent. Think how you might share what you love for an evening or an afternoon. It’s a fun way to share your interests and to raise money! How about you? What are some of your favorite adoption fundraising ideas? Jennifer S. Jones is a writer, performer, storyteller and arts educator. She holds an MFA (Playwriting) from NYU Tisch. She has written numerous plays including the internationally renowned, award-winning Appearance of Life. In a small government office in China, Jennifer became an adoptive mother. She is passionate about the adoption community and talks about the ins and outs, ups and downs, joys and “is this really us?! ?” whenever she can. She writes about her experiences at <a href=”http://www.letterstojack.com/”>www.letterstojack.com</a>.